MOSCOW, Dec. 31 (Xinhua) -- China and countries of Eurasia strengthened cooperation across various fields in 2017, opening opportunities of economic development for the whole region. Earlier this month, the Yamal liquefied natural gas (LNG) project in the Arctic jointly launched by China and Russia began operation. Russian President Vladimir Putin pressed the button to start the loading of the first gas tanker. The project is expected to have three production lines by 2019 with a total capacity of 16.5 million tons of LNG every year. Russia's share in the global LNG market will rise from about four percent to more than eight percent. Chinese enterprises invested heavily in the Yamal project and will operate 14 of the total 15 LNG tankers. 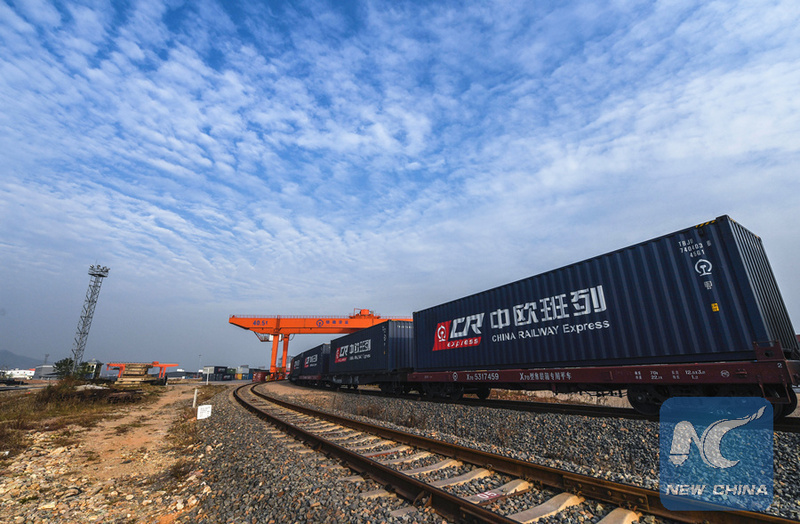 The megaproject marked a milestone in China-Russia cooperation under the Belt and Road Initiative proposed by Chinese President Xi Jinping in 2013. The initiative comprises the Silk Road Economic Belt and the 21st Century Maritime Silk Road, and aims to build trade and infrastructure networks connecting Asia with Europe and Africa on and beyond the ancient Silk Road routes. The Yamal LNG will be shipped to Asia in the summer through an efficient Arctic shipping route along Russia's northern coast, which China and Russia aim to build into a "silk road on ice." Trade and investment remained solid in 2017. Chinese direct investment in Russia grew 34.1 percent in the first three quarters this year, according to the Chinese Ministry of Commerce. Russian courier Maria Rubtsova became popular among Chinese netizens during the Nov. 11 "Singles' Day" shopping spree this year, after a picture showing her delivering parcels on a horse went viral on the Internet. Chinese e-commerce giant Alibaba said about 22 million Russian people, roughly one sixth of the country's total population, use its outbound platform AliExpress to make purchases online. A day after Xi delivered a report to the 19th National Congress of the Communist Party of China (CPC) in October, Putin said he was "very closely" following the event. "We have great cooperation plans with China in the areas of space, high-tech and energy. These are the bases for the future development of Russia-China relations," Putin said, calling China a major propeller of the global economy. On the sidelines of the Asia-Pacific Economic Cooperation Economic Leaders' Meeting in Vietnam in November, Xi told Putin in a meeting that their high-level efforts in guiding the long-term growth of China-Russia ties have achieved gratifying results. Putin said Russia stands ready to enhance cooperation with China in regional and international affairs, carry out closer communication and coordination within multilateral frameworks and push for the creation of the Free Trade Agreement of the Asia Pacific. Since Xi proposed building the Silk Road Economic Belt in Kazakhstan in September 2013, Eurasian countries have shown great interest in cooperation with China in search of opportunities to develop their domestic industries and improve infrastructure connectivity. This May, the presidents of Russia, Belarus, Kazakhstan, Kyrgyzstan and Uzbekistan attended the Belt and Road Forum for International Cooperation in Beijing and signed together with other world leaders a joint communique supporting global and regional cooperation. With Kazakhstan currently serving as a hub connecting Asia and Europe, freight can flow easily between the Pacific and Atlantic coasts via the landlocked country. China and Kazakhstan are implementing 51 industrial capacity cooperation projects worth more than 26 billion U.S. dollars. A China-funded cement factory in Tajikistan was the first concrete producer ever in the country. The "Great Stone" joint industrial park in Minsk has attracted about two billion dollars of Chinese investment in Belarus. Electronic product manufacturers such as Huawei, Xiaomi and Haier, among other Chinese brands, have secured a firm footing in the Eurasian countries. Confucius Institutes have stimulated enthusiasm for Chinese language and culture in the whole region. Over the past year, the ancient Silk Road has proven its worth as a source of prosperity and cooperation for China and its Eurasian partners, and more of the same is expected in 2018.